I like spiders outside and not on my walls. I imagine I am not alone in that sentiment. Lately I have been captivated by spider webs. I have risked discovery while sneaking pictures in neighbors’ yards. I have been discovered and it was awkward. 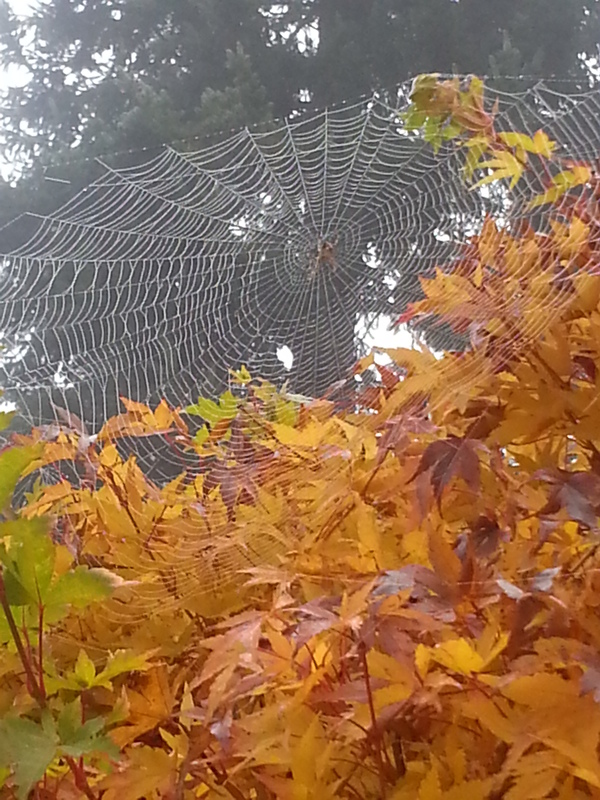 I saw a friend walking and taking pictures of webs on a cold foggy morning. We laughed at our shared obsession. Regularly I will walk to my car and directly into a spider’s web. Overnight a path from fence to side mirror has emerged. It always annoys me as it takes precious seconds to free myself from the sticky remains. It seems all the more surprising when I leave my front door and see several webs in various stages of completion covering my bushes. The difference between the single strand of web on my car and the intricately detailed web cradled in my foliage is that one has been given time and space away from interruptions. Our life can be viewed as a web. The stages and sections of our life woven strand by strand into the whole. No two webs are alike anymore than any two lives are identical. Our lives are being woven together by a Master Weaver. The other day, I watched a spider do what it was created to do. weaving process I had not examined. Interesting how a web is most clearly outlined in the damp fog yet more difficult to see when the rays of sun are plentiful. If you look very closely at the center and draw your eyes to the left and right, you will see that the center of the web is actually fully framed. The web outline is faintly drawn in. The spider is going over the web a second time to clearly define the network. We have been given a life by God. 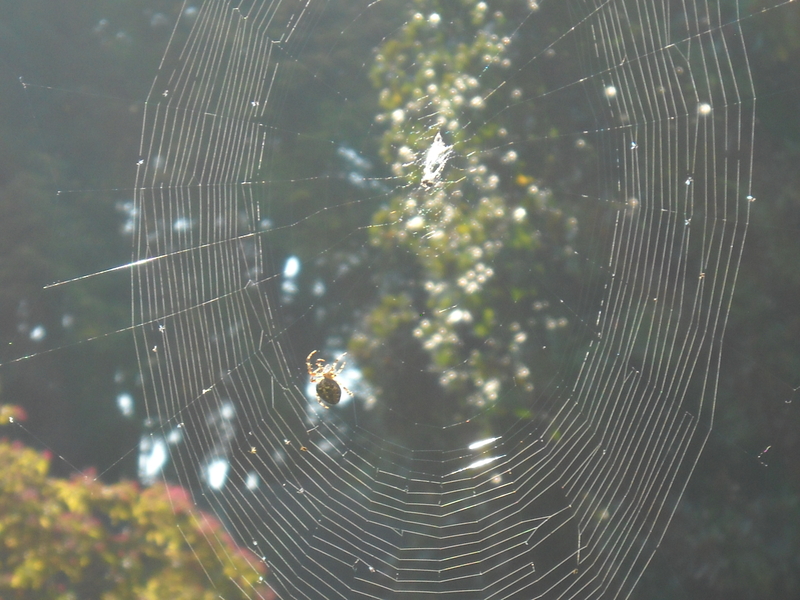 I wonder as God redeems our missteps and hardships , if it is a bit like the spider redefining the threads of a web. Because nothing is without benefit with God. Even our failings are teachers. find joy in being stuck to the sticky web of God’s comfort. causing it to be stretched and pulled apart and sometimes even dismantled. He’s undaunted by temper tantrums and doubts. He courses over the fragile sections and fortifies them with Himself. He remains to do the needed work. Perhaps today you feel like your web is beyond repair. Maybe you believe He has stopped weaving. Or the forces against you seem too strong for the weaving to keep up. I can say with unflinching confidence that He has never ceased His master handiwork. Because you are a masterpiece in His hands. One day, all that is seen and all that is hidden will come together in completion. Here’s a song that has been on heavy repeat mode in my car lately.